Former Federal Reserve chairman Alan Greenspan said this week that he "made a mistake" in trusting that the free market could regulate itself. Speaking to the House Committee on Oversight and Government Reform, he said, "Those of us who have looked to the self-interest of lending institutions to protect shareholders' equity, myself included, are in a state of shocked disbelief." 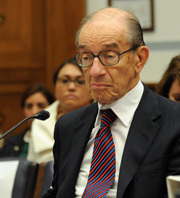 Was Greenspan's admission of error good news, bad news or no news? Election Day is still a week and a half away, but voting is under way in several states that offer early voting options. And it's a hit. In states like Georgia and North Carolina, early voting was double the pace of the 2004 election. High numbers seen all over the country. Is this good news, bad news or no news? Okay, I don't know what to make of this one, but perhaps you do. It was reported this week that the RNC spent $150,000 outfitting the governor of Alaska with clothes purchased on shopping sprees. There is nothing illegal about this, but some Republicans grumble that that money could have been spent to more directly help a campaign that's trailing in the polls. Was the $150,000 wardrobe good news, bad news or no news?